After nearly a decade of planning, arguments, and heated discussions, the National 9/11 Memorial opened to the public in New York City in 2011. In memory of September 11th, we're taking you on a virtual tour through this moving memorial in lower Manhattan. Designed by architect Michael Arad, the memorial is a sensitive, respectful complex in the heart of the new World Trade Center site. 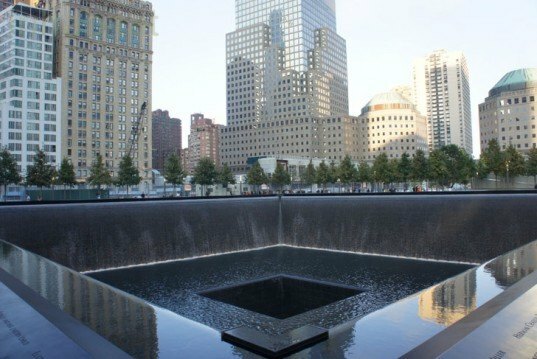 Two vast reflecting pools, located in the exact footprints of the Twin Towers, are the focus of the site. Standing at the edge of the large voids, with the waterfalls drowning out the sounds from the surrounding construction sites, one easily remembers the magnitude of the loss we experienced that day. Visitor passes to the memorial are booked through the end of October, but through our exclusive photo gallery, you can view the memorial and see its graceful elegance.